Research and Motion brought a few Playbooks to CES that were running the new OS2 update that will be pushed to all devices sometime in February. This is one of the most eagerly anticipated updates because it will bring added functionality to the Playbook and make it feel relevant again. There were a few key features RIM was pushing with this new update and one of them excited me in particular. We will finally be getting a fully functional email client that will use the company’s famous PUSH service that sees them instantly delivered. Not only can you use company email, but also Gmail and other mainstream addresses, too. Emails will be contained within a unified email box, much like their smartphones. This will add some separation between your official company email and your personal ones. Another exciting feature found in the email is your Twitter and Facebook timeline we also be shown. This is a cool feature because it combines their social platforms with email and puts it all in one place. The App World for the Playbook houses customized applications that were strictly developed for the tablet by developers. The company claims there are around 30,000 available, but if you visit the store often, it does not seem like there are that many there. If you have been following the Playbook world, you know the company is offering an Android conversion process for end-users that will change APK to BAR. For your average user, converting Android files to Playbook compatible ones is not the easiest thing to do and RIM recognizes this. With the OS2 update they will be encouraging existing Android developers to convert their apps and games to a Playbook friendly format and then list them in their App World. A RIM spokesman told us that Android files converted to a Playbook version will not have their own individual section in the market. Instead, all of the content will be lumped together with native applications, which will make it easier to find new content. This feature is very exciting, because not only will you have access to hundreds of thousands of existing Android apps, but your Playbook will give you the best of both worlds—RIM and Android. I am looking forward to e-Reader apps from Sony, Amazon, Barnes and Noble, and Aldiko officially listed on the market. This will hopefully inspire existing Android developers to pay attention to the QNX platform because the conversion process is actually fairly simple if you are tech savvy. Finally, another cool feature is the new version of the Bridge software that allows your phone to be paired with your tablet. Right now, this is the only way you can enjoy native email, calendar, and other core functions. We saw the new ability to use your Blackberry Phones touchscreen to interact with the tablet and launch applications. This will allow you to do a few very cool things that no one has really talked about. 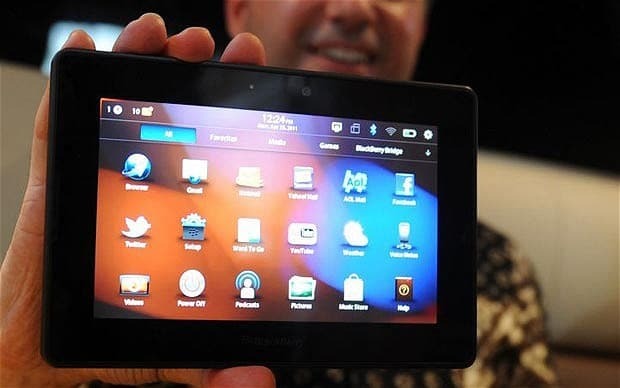 For one, you can connect your Playbook to a protector or a television and then use your phone as an external remote. This will be handy if you are giving presentations or want to play movies or songs. Not only can you use your phone as an extension of the Playbook, but you can also launch applications and close existing ones. In one of the demos we saw, people connected the tablet to a large screen TV and were using their phone to play Angry Birds. This was the first time I got to see the new OS2 update for the Playbook and it will be sweet once it drops. Seriously, the Playbook is a great piece of hardware. It features a 7 inch screen and dual core processors, it really blows most tablets out of the water in terms of how powerful it really is. The one thing it suffered from was the lack of email and a wellspring of applications, but the new update will seek to fix this once and for all.